Woodhead completed the first phase of a major refurbishment project at North Kesteven Sports Centre and replaced the existing 6100m2 sand based Astroturf pitch with a 40mm 3G artificial multi-purpose pitch. It was a turn-key design and installation project, and included replacing the shock pad underneath the playing surface, and renewing over 400 metres of perimeter security fencing. Events raised £1,000 for the Lincolnshire & Nottinghamshire Air Ambulance. To mark the successful completion of the 3G sports pitch Robert Woodhead Ltd held a two day Football Festival across two separate weeks. The first footballing event saw teams from North Kesteven District Council; SCAPE, Leisure in the Community and Robert Woodhead Ltd take part in a project team football tournament. This event raised £1,000 for charity, and was donated to the North Kesteven District Council’s Nominated Charity, the Lincolnshire & Nottinghamshire Air Ambulance. The second event saw Robert Woodhead invite junior football clubs from across Lincolnshire to take part in the first ever junior football tournament on the new 3G pitch. Ten teams in total at Under 9 and Under 12 level played out a series of fun games. 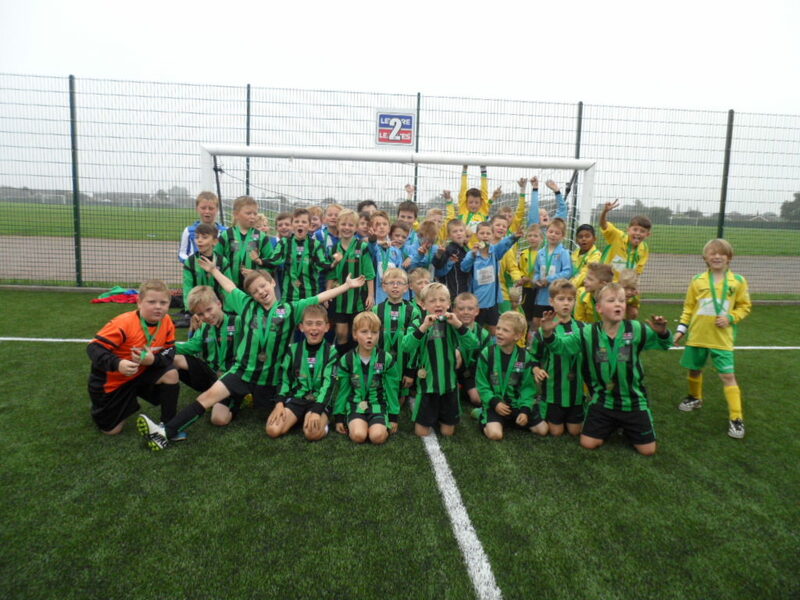 Whilst the Under 9 games were non-competitive matches, the Under 12 teams contested in a competitive mini-league. All players who took part in the event were presented with a medal to remember the day. The Sports centre is located on the same site as North Kesteven School. The school like the sports centre was operating as usual throughout the project. Deliveries and contractors coming on to the site needed to ensure they didn’t infringe the day to day operations of either the school or the sports centre. Woodhead hold ‘teamwork’ as one of its 5 core values, and regular interaction with the client ensured that deliveries were conducted at specific times to avoid disrupting any of the school and sport centre activities. Working together was a pivotal part of ensuring that the project was delivered in the identified time scales. One particular activity of importance that Robert Woodhead identified was the annual school sports day. To avoid any potential logistical difficulties the entire site team ceased work during the event. This down time was scheduled in at the start of the project, and did not affect the affirmed deadline. The challenge lay in creating a 3G pitch that met the required values in each of the above areas, for each sporting body. An example of designing to contrasting values would be FIFA stipulates that a rebound Resilience of 60-100cm is needed; however the FIH requires a rebound resilience of 10-40cm. The solution to this challenge came through conducting a series of comprehensive tests on the playing surface prior to the pitch being fitted. The tests assessed the overall performance, quality, and durability of the 3G surface. Once the 3G pitch had successfully passed these rigorous tests it is then laid. Upon completion an independent inspection took place which measured the results for each variable, and the final playing surface met every required score. “Using the empa ii Minor Work Framework we identified that Robert Woodhead could deliver this project within the timescales we were looking to achieve. They looked at a local supply chain, and looked at materials and a local specialist contractor to work on that for us. It enabled us to get the community back on that pitch and using it as soon as possible. We finished with a very good product and also everyone was engaged and part of that process, so NKDC are very appreciative to have a contractor on board that had those values and made the project work”.